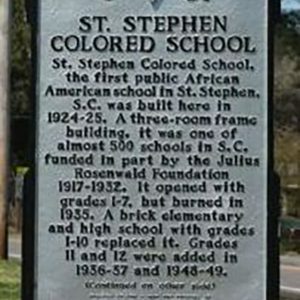 The first public African American school in St. Stephen was built in 1924-25. 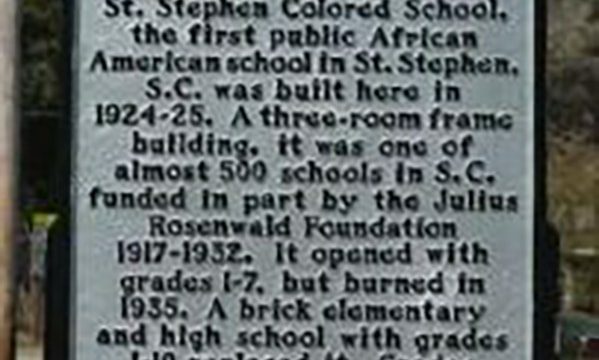 A three-room frame building, it was one of almost 500 schools in S.C. funded in part by the Julius Rosenwald Foundation. It opened with grades 1-7, but burned in 1935. A brick elementary and high school with grades 1-10 replaced it. Grades 11 and 12 were added in 1936-1937 and 1948-1949. A nine-room brick high school was constructed in 1944-45 and the school closed in1954. The buildings were torn down in 1965 and their bricks and lumber donated to Allen AME Church.